A voltmeter, with a needle. Many of us are engaged in an unending search for fresh, impactful ways to convey simple ideas. We use phrases, metaphors, and images that we believe few have heard or seen. For maximum impact, we must be the first, or among the first, to use them. But with use, their impact declines, until the phrases become trite. At that point, using them marks the users not as dynamic leaders, but as followers, unaware that the usage is now passé. Here's Part II of a list of phrases that are no longer fresh. See "High Falutin' Goofy Talk," Point Lookout for November 13, 2002, for Part I. This is a pun on "leading edge." The leading edge of a field of knowledge is where we would find the latest or most up-to-date set of practices, tools, procedures, and so on. The bleeding edge is ahead of that, and consequently, riskier and perhaps less reliable. The term leading edge is probably a reference to the forward edge of an aircraft wing. often that they aren't worth repeatingmetaphors, this one was powerful once, and even funny at the level of a chuckle. It's now so overused that the funny has worn off. The meaning of this one is about equivalent to c'est la vie — that's Life, or that's the way it goes — older expressions that have served us well. Using this more recent form of c'est la vie was advantageous to the user when the new form was fresh. It drew positive attention, and emphasized the user's point. It's no longer fresh. C'est la vie. This phrase is a metaphor for making a small change, one that just barely registers. 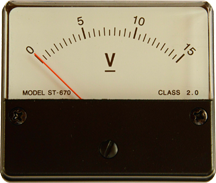 The needle in question here is the needle of a meter on the display panel of a measurement instrument, such as a voltmeter, fuel gauge, or VU meter. To "move the needle" is to induce a change in the quantity being measured significant enough to cause the meter's needle to move. One speaks of moving the needle only when the changes are relatively small. Use of this phrase is increasing, but nevertheless, it's overused. Why not just describe the change as "small but noticeable" or "small but profound?" A game-changer is a new technology, strategy, proposal, team member — new something that alters how a situation will evolve. The term became popular in business in the 1990s, but it was first used in sports in 1982 [Safire 2008]. The term game-changer is no longer fresh — no longer, um, a game-changer in meetings. Try transformative — it's more erudite. This phrase is a suggestion, request, or command to two or more people, usually in a meeting, to please continue their exchange at another time, not in the meeting. It was clever once, when most meetings were face-to-face. The users of the phrase were then able to convey the idea that most of their meetings, unlike the current one, were mediated electronically in one form or another. At the time, it indicated the user's elevated status or importance. Today, though, virtual meetings are common. To "take it off line" is now very often literally correct, and using it conveys no impression of elevated status. An alternative is asking, simply, "Can you suspend for now and continue after the meeting?" This column, like the monument it is named after, intrigues my imagination (i.e., makes me think). For me, that is the highest recommendation I can give short articles like these. Would you like to see your comments posted here? rbrennkWwmGTWXbiDQWgZner@ChacPRbDIuHZxcDxPKKXoCanyon.comSend me your comments by email, or by Web form. I offer email and telephone coaching at both corporate and individual rates. Contact Rick for details at rbrenjFUiotncvqZLGmoSner@ChacbytAbqjEMDkcaCbwoCanyon.com or (650) 787-6475, or toll-free in the continental US at (866) 378-5470.